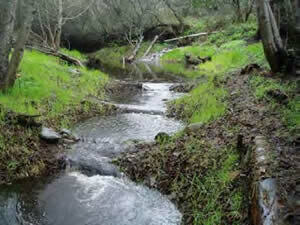 Beginning in the late 1990s, eight watershed restoration plans and a number of other related assessments were developed for seven watersheds in Santa Cruz County. Funded variously by the California Department of Fish and Wildlife, the Coastal Conservancy, and the Regional Water Control Board, these plans were carried out by local governments, nonprofits, and watershed groups with oversight by technical advisory committees. Anticipating the completion of the plans, the focus turned to ways to effectively implement the recommended projects and programs. This focus led them to the realization that restoration of watersheds was currently being hindered by a combination of stumbling blocks including competition for limited funds, inadequate information on design processes, a lack of public outreach/ education, permitting complications, and an absence of coordination between resource and funding agencies. Wanting to alleviate some of these stumbling blocks, staff from the Santa Cruz County Resource Conservation District (RCD), Coastal Conservancy, California Department of Fish and Wildlife, Coastal Watershed Council, and the City and County of Santa Cruz began brainstorming possible solutions. 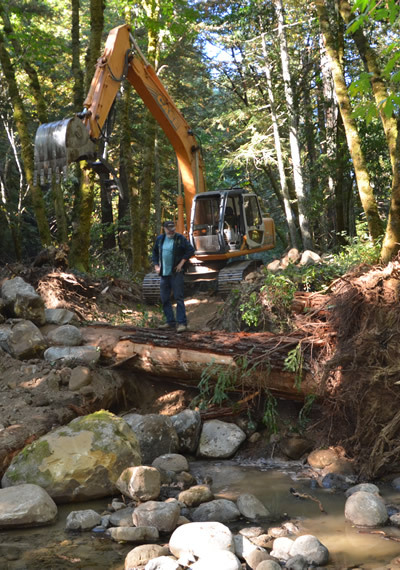 They recognized that watershed restoration would be more effective as a coordinated county-wide effort and in May 2002 they developed the concept for the Integrated Watershed Restoration Program (IWRP) for Santa Cruz County. The first phase of IWRP was established in 2003 with a $4.5M grant from the Conservancy. In 2008, IWRP was expanded to include San Mateo and Monterey Counties. The Coastal Conservancy has played a pivotal role in IWRP, providing critical funding for designs and permits for selected projects, technical assistance to develop projects with resource agency guidance, and leveraging funds for implementation. The Conservancy’s $6.5M investment over the period of 2003 to 2013 has resulted in raising over $14.5M to implement more than 150 restoration projects - protecting natural resources while boosting local economies and creating much-needed jobs. The Resource Conservation Districts solicit for projects on an infrequent basis. These projects are then collected and sent to the IWRP Technical Advisory Committee (TAC) that identifies high priority projects and provides oversight for their design, environmental compliance, and construction. After this step the RCD acts as a hub that connects project sponsors, like the Coastal Conservancy, to these TAC selected projects to streamline the process for getting these projects funded and completed. 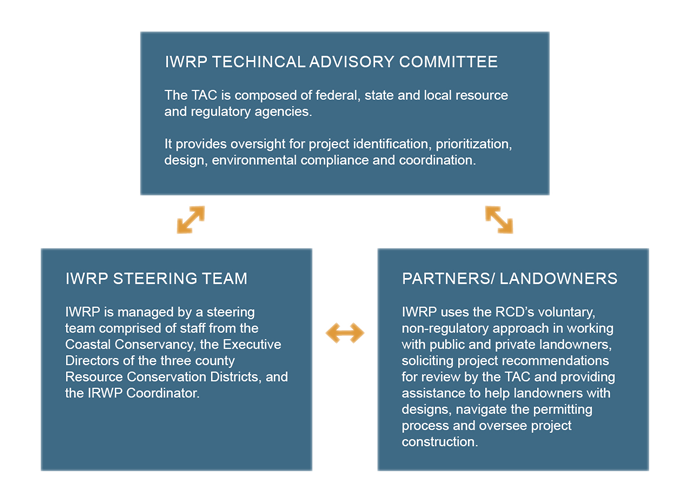 The IWRP Coordinator helps identify the best strategy for meeting environmental compliance requirements and helps shepherd permits through by reviewing applications and serving as a single point of contact between landowners and regulatory agencies. This helps the landowner navigate the complex permit process and reduces the staff burden on the regulatory agencies. If you have an idea for a project, please complete the Project Solicitation Form. This list is not exhaustive but it illustrates the breadth and depth of the relationships IWRP and the RCDs have developed in Santa Cruz, San Mateo and Monterey Counties.